Many Canadians are shopping for loose diamonds and engagement rings online and are saving money by purchasing quality jewelry products made in the United States. There is no duty on diamond rings shipped to Canada. You will not find lower prices for loose certified diamonds than at Novori Jewelry. We make custom diamond engagement rings and ship them anywhere in Canada. You can also enjoy huge savings by purchasing certified diamonds and rings from Canada with our online virtual diamond showroom. All of our diamonds come with the original GIA, AGS, or EGL diamond certificates. Select the diamond engagement ring setting and add the certified diamond to make a complete ring. We make purchasing diamond jewelry from Canada safe, secure and worry free. Our collection of diamond engagement rings are set in platinum or gold and combine timeless style and exquisite quality that she will treasure forever. Our engagement rings are custom made for your order in the USA. No cheap imports with inferior quality. We ship diamond engagement rings to anywhere in Canada. Stunning engagement rings including traditional solitaire settings, rings with side stones, three stone rings, tension rings, and more. All of our shipments of engagement rings and diamond jewelry to Canada are fully insured and shipped right to your door. To cover the additional costs of shipping to Canada, we will charge $40 US shipping for all orders to anywhere in Canada. That includes all Canadian provinces - British Columbia, Alberta, Saskatchewan, Manitoba, Ontario, Quebec, Prince Edward Island, Nova Scotia, New Brunswick and Newfoundland and Labrador. You can live in Victoria, Vancouver, Toronto or Halifax - or anywhere in between; we can make a special diamond ring for you! Is there any duty or importation tax on rings and jewelry shipped to Canada? There is no duty charged on your ring, diamond or jewelry purchase. However, you will be required to pay HST or GST and, if applicable in your province, the PST. This will be collected by FedEx™ once your engagement ring or diamond jewelry arrives in Canada. Are there shipping charges when shipping diamonds or jewelry to Canada? In order to ship your diamond or jewelry purchase to Canada, we charge $40 US in order to cover the additional insurance and shipping fees. Do you charge in US or Canadian dollars? 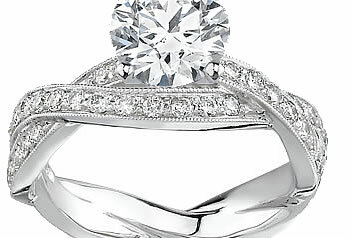 All prices on our web site for diamond engagement rings, diamonds and jewelry are in US dollars. 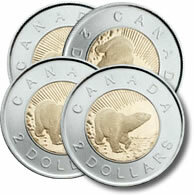 For orders from Canada we may require payment by bank wire in US dollars. We will provide you easy instructions on how a secure payment is made by bank wire. In some cases we will allow payment by credit card. We will charge your credit card in US dollars and your credit card will convert the jewelry purchase to Canadian dollars at their exchange rate. How long does it take to ship jewelry to Canada? Although we may ship your package by FedEx™ overnight, the delivery of your jewelry could be delayed in customs. We will ship your diamond jewelry purchase fully insured by FedEx™ but once it arrives at the border, delays may occur once in customs which is beyond our control. Please plan for at least one or two extra shipping days for this reason. Most rings can be delivered within a few days. Diamond engagement rings from Canada can cost you thousands of dollars more. Most jewelers in Canada purchase their loose diamonds and diamond ring materials in the United States, then mark it up for Canadian pricing. Not so at our online diamond engagement ring web site. You purchase the certified diamond from our list of thousands of diamonds then select your diamond ring setting right from the source. Some of our diamonds are Canadian diamonds and are mined in Canada. All of our diamonds are natural and conflict free diamonds. Purchasing your diamond ring from the USA and having it shipped to Canada is a safe and secure way of purchasing the ring of your dreams with no hassles or risk. If you need assistance we are only a phone call away.